As my last post noted Greece, the home of the ancient philosopher Epicurus, rejected fiscal restraint and austerity in exchange for “Hope is coming” debt finagling. “Syriza” or “Let the Good Times Roll Without Repercussions Party” has won a short-lived victory in Epicurean Greece: “Avoid pain or at least spread it around. Give it to someone else. Let us work a few hours a week and then let us seek our pleasures. Let us surround ourselves with good friends and good drink. Forget the creditors. Those fools believed we would pay them back”. And so it goes in ancient modern Greece. Well, back in the day Epicurus had an even bigger dilemma than a fiscal crisis. But it was a problem that he was able to philosophize or finagle away with even bigger denial than today’s Greeks. I am talking about the problem of evil. The problem of evil–whether viewed as a man being burned alive or as a Roman crucifixion or as someone stealing cigars from a mini-mart or as one neighbor lying to another neighbor-is in our face daily. This enormous topic can only be glanced at in this post. I will give you a perspective to consider. First, let’s see what Epicurus foisted on his followers from his hammock ‘high horse’. If an omnipotent, omniscient, and omnibenevolent god exists, then evil does not. Therefore, an omnipotent, omniscient, and omnibenevolent God does not exist. This perspective of the problem of evil is held by many in the world. It is a perspective which atheism willing points to and one that bothers agnostics. It is a perspective that lends itself to the myopic religion of scientism where everything can only be validated through scientific proofs or, basically, through one’s senses (a more refined Epicurean philosophy). Yet, the above logical problem of evil is self-defeating. It assumes knowledge of good and evil. One has to ask, how did Epicurus determine good and evil and the truth that defines them? Did he feel their effects via his physical senses? Did he and his friends determine what is good and what is evil via their collective senses? 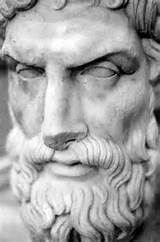 Did Epicurus make up ‘truth’ about good and evil by what his friends let him get away with saying? Or did Epicurus as a proto-Foucault define ‘regimes of truth’ as “the historically specific mechanisms which produce discourses which function as true in particular times and places”? Or, did Epicurus, as President Obama has recently done at the 2015 National Prayer Breakfast, use moral equivalency or relativism (in this case, high horse lecturing Christians with historical error) as a basis to decide what is a good and what is a bad by comparison (with God as a rubber stamp). It should be noted that none of these premises and perspectives is based on a perspective outside ones’ self or on an Absolute reference point. At the epicenter of these premises is self-serving man, ergo the likes of the American Humanist Association and their motto: “Good Without God“. If you believe as pre-Darwin-pre-Enlightenment-pre-scientism Epicurus believed-that humans are just randomized atoms (as he called them) that “swerved” and collided to form the materialistic world-then how did a rational concept of good and evil enter our gardens of random atoms? Remember, in Epicurus’ worldview god had been expelled from the garden of good and evil. This early formulation of the logical problem of evil, as I see it and now describe it, is when the Epicurus “High-Horse” Mal-ware began its download hactivism into the software of our networked psyche creating a down-through-the-centuries botnet. This Mal-ware put God in the “Recycle Bin” and made Him inaccessible. It also redirected our boot up executable file to scientism, making it our default root drive. Social manipulation by amoral hactivists and humanists keeps the botnet going. The Epicurus “High-Horse” Mal-ware searches for any thought of God and seeks to delete it from your consciousness. It causes doubt spam and creates a zombie-like effect with regard to outside-your-senses thinking. You are made subservient to a ‘regime of truth’, to those who now have the power to control truth. And, there are many who would desire to do so in this present age. And remember, Pontius Pilate asked Jesus “What is truth?” as if Pilate could willy-nilly define truth through his earthly power. For the sake of brevity I think you will agree with me that the logical problem of evil comes down to premises and perspectives. You may also agree with me that there is a need to wipe clean the hard drives of our minds of all Epicurus “High-Horse” Mal-ware. …it is impossible to distinguish evil from good unless one has an infinite reference point which is absolutely good. Otherwise one is like a boat at sea on a cloudy night without a compass (i.e., there would be no way to distinguish north from south without the absolute reference point of the compass needle). The infinite reference point for distinguishing good from evil can only be found in the person of God, for God alone can exhaust the definition of “absolutely good.” If God does not exist, then there are no moral absolutes by which one has the right to judge something (or someone) as being evil. More specifically, if God does not exist, there is no ultimate basis to judge the crimes of Hitler. Seen in this light, the reality of evil actually requires the existence of God, rather than disproving it. If Epicurus had read the even more ancient book of Job perhaps he would not have been so clueless and the “High-Horse” Mal-ware would never have been downloaded with its intent on hacking into our truth files.